Lozenge form and powerful natural supplement that contains vitamin B-12, which supports cognitive function and nervous system health. 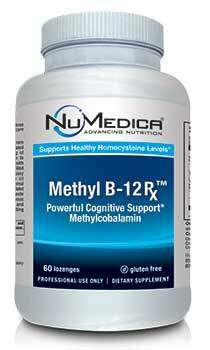 NuMedica Methyl B-12 Rx is available in great-tasting lozenge form to provide you with active vitamin B-12 to support the maintenance of your healthy nervous system and enhance your cognitive function. Because vitamin B-12 is vital for cell division and DNA synthesis, it plays an integral role in the body, especially for cells that multiply rapidly like blood cells. NuMedica Methyl B-12 Rx also supports neurological and cardiovascular system health, making it an extraordinary supplement that complements multi-type systems throughout your body. 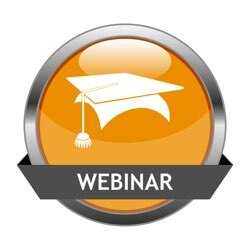 NuMedica is a leader of the nutritional supplement industry. The company's safe and effective products set the benchmark for the field and continue to be revered among a growing customer base that prefers to rely on natural and nutritional products to support optimum health. Vitamin B-12 is a water-soluble vitamin that supports the nervous system, adrenal function, metabolic processes, and much more. Avoiding a vitamin B-12 deficiency is essential. People who are deficient in vitamin B-12 may experience anemia, decreased appetite, memory loss, dizziness, confusion, and fatigue. An optimum level of this vitamin ensures that our bodies get the support it needs to function as it should. Moreover, by maintaining our body's supply of this essential vitamin, we can support overall good health. The body requires vitamin B-12 for the production and maintenance of red blood cells. This micronutrient supports methylation, a metabolic process of cells. While providing support for the nervous system, vitamin B-12 may also provide support for the cardiovascular system. Some studies indicate that this vitamin could help reduce homocysteine levels associated with hardening of the arteries and blood clots. 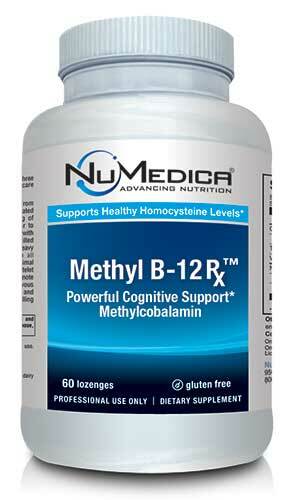 A high homocysteine level could indicate a vitamin B-12 deficiency. Directions: Chew or hold one lozenge in mouth daily until dissolved or as directed by your healthcare practitioner. Other Ingredients: Fructose, sorbitol, cellulose, citric acid, stearic acid, natural flavors and vegetable stearate. Provides a therapeutic dose of B-complex vitamins to support healthy energy levels, metabolism & neurological function. Powerful supplement with therapeutic levels of B vitamins that support cardiovascular system health.